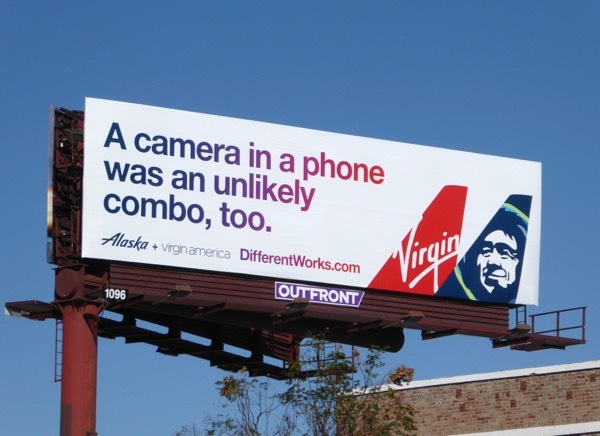 This past decade has seen it's fair share of airline mergers, in fact ever since the events of 9/11 in 2001 shook up the air travel industry in America, from Delta and Northwest to United and Continental, to Southwest and AirTran, American and US Airways, now you can add Alaska Airlines and Virgin America to the list. 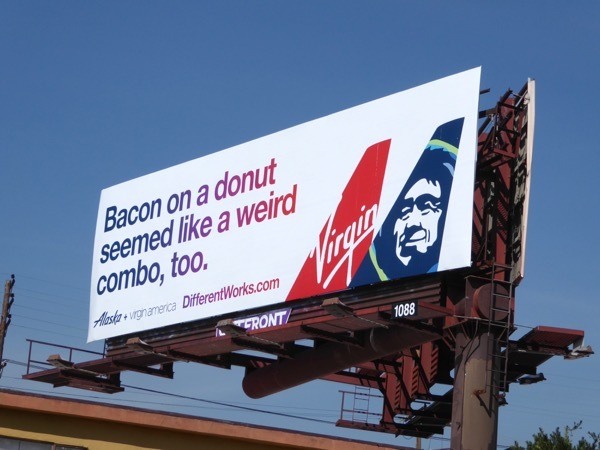 As their latest joint ad campaign points out, their alliance seems like an unlikely and surprising combo, but opposites do attract and even though they may seem different on the surface, the airlines do share similarities. 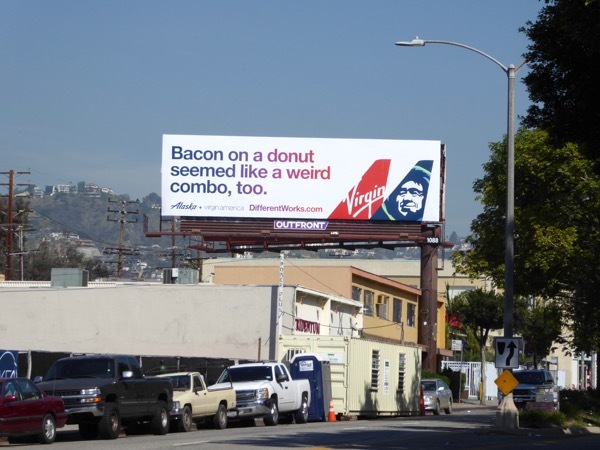 For its part, Virgin America certainly seems to bringing its unique levity from its outdoor advertising to this new venture. 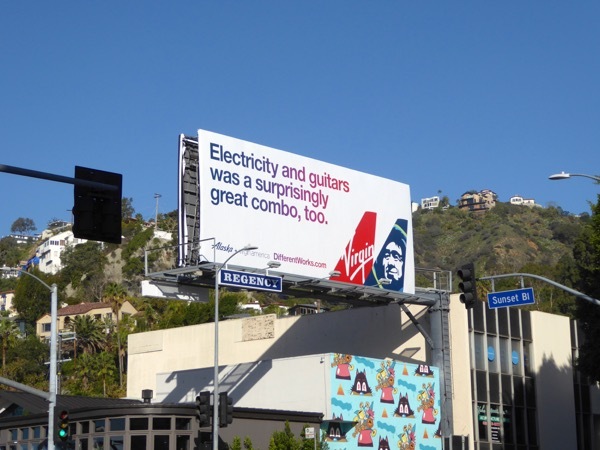 The 'Electricity and guitars' ad creative was snapped along Sunset Boulevard at Crescent Heights Boulevard on February 12, the 'A camera in a phone' billboard was spotted above the intersection of Cahuenga and Sunset Boulevards on February 28, whilst the 'Bacon on a donut' version was photographed above Fairfax Avenue on March, 2017. 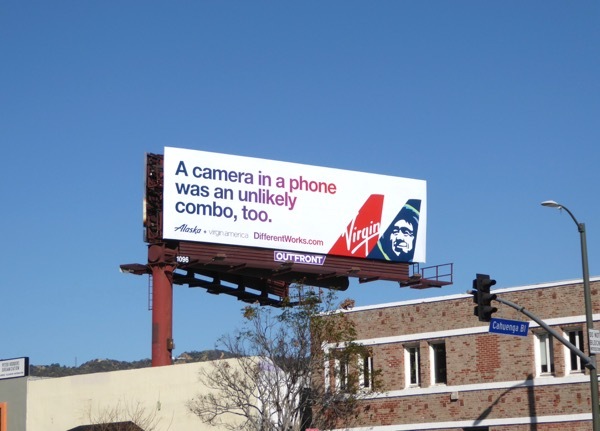 If you're a fan of the airline, be sure to check out all these Virgin America billboards from recent years filling the skies of L.A. and San Francisco, plus you can also enjoy this special Alaska Airlines LAX to Costa Rica billboard from last summer. Only time will tell how well different works together and how soon the airlines will change their name. 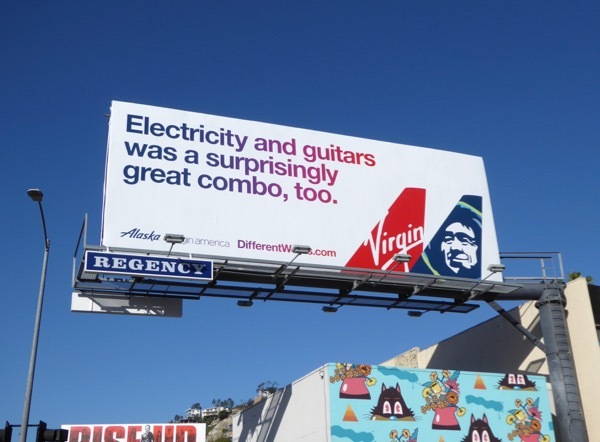 Virgin Alaska, anyone? Whatever you're getting up to this weekend, safe travels.